The Glory Gals: Who have you talked to?? 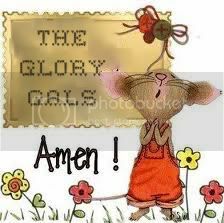 Gals, its not about us, our food, our calories or our waistlines, its about His Glory. Lets walk our journey together and chat awhile. Im glad you stopped by. Who have you talked to?? I have talked to many woman about this journey, I have given and sought their encouragement and have had lots of opportunities to chat about The Glory Gals and often I have found that many of us struggle with our weight and it is one of the major things that really effects what we think about ourselves in a negative way. I have also heard over and over again that it is often a big part of our lives that we dont commit to the Lord, we pray over our families, our jobs, bills and many things but we seem to hold back on this area. I felt like my weight was evidence of my failure, and in guilt and condemnation, I felt it was my problem to get my act together alone. I could chat with my girlffriends and bloggy buddies but when it came to praying about it I was silent. I enjoy reading a chapter of Proverbs for each day, Chp 1 on the 1st and so on, & since there is 31 of them they fit beautifully. Do you do this too? Today I was reading Chapter 16 and I never stop being amazed that you can read the Bible and get fresh words for your day each time even if you have read the passage many times. Today in Prov 16.3 God says afresh- commit whatever you do- not some things. He is interested in all that we are doing and He wants to be a part of it. This lead me to thinking about the reality of commiting my weight journey to the Lord. A commitment- that sounds pretty serious. It involves accounatbility and perserverance. If everyday I am struggling and not sure of my direction, resolve and success and then I have to ask myself: Am I planning this journey or is He? If I have commited my journey to the Lord, He is establishing my plans. If I am planning it, and I'm woried, anxious or defeated then I have not committed it totally to the Lord. If God is establishing my planning then I am not discouraged, uneasy or worried, I am walking where He want me to be and I can reject all of that negative thinking and know I am in His plan. He has established the plan- He has set it in motion -just as establish is defined by Mirriam Webster as to institute, to bring into existance, to make firm or stable. The word established is repeated: God establishes your plans and God establishes your steps. Its not just an idea, a plan that has been instituted, bought into existance and made firm and stable by God as we have commited what we are doing to Him. Then something else happens, the plan goes into our heart. It becomes part of us. It is no longer a chore but it is in my heart. God doesnt leave it there. God works things out of our heart into our everyday life. Proverbs 16.9 speaks of how God also wants to set up our action- our doing- our steps. Steps aren't the goal themselves, they are the little movements that make up our journey. They are intentional, they are purposeful, they are goal oriented. They are the consequence of what is in our heart and they are established by God. Have you committed your journey to The Lord? If not what is holding you back? What steps is God asking you to take to make this journey? How do these Scriptures challenge you today? This is really something to think about. We may say we are committing our ways to the Lord, but is that really true? If we really have, then we should have peace knowing that He is in control. But too often, we try to plan our ways, like you said. I love those verses. I confess I have half-heartedly committed my plans for weight loss to the Lord. I've been hanging on, but God has made some things so clear to me... food is an idol and place of comfort that really only leaves me with 2 things... wanting more and guilt. Nothing good about either of those things! I got my Made to Crave book in the mail and am feeling like for the first time that things are going to change finally. I'm not talking about my body either I'm talking about the shift in my thinking that needs to occur. The weight loss will only be a byproduct of my giving up this god I've made out of food. I can't wait to see what He does and to see Him more clearly after this cloud of deception has cleared!